From its eerie opening of spellbinding lights and screeching strings to its dark and unexpected conclusion, Under the Skin is a distinctively unnerving sci-fi horror that carries no bounds to any source of conventionality. Director Jonathan Glazer emphasizes on creating scenes with Buñuel-style mood and texture, utilizing minimal dialogue to make viewers grow uncomfortable in their seats. Glazer, who has been on hiatus for the past decade, also channels Kubrickian imagery for a glowing emphasis on humankind itself. After watching Under the Skin, I felt bewildered and confused at Glazer’s ponderings but was somewhat satisfied and amazed at this surreal portrait he has painted, which will probably benefit from additional viewings to further contextualize the thematic material the picture presents. Glazer’s nightmarish conception centers on an extra terrestrial being who takes a human form in Glasgow, Scotland. Scarlett Johansson, an actress who often fronts beauty magazines, plays the alien and her lustrous aura is used ironically as a tool of destruction. Indeed, Johansson’s creature, who covers herself with luxurious clothing and make-up, is a temptress but also a predator, who uses her sultry looks to lure men into a black cesspool, where they are consumed and devoured into empty bags of skin, a conceit that makes the worms of Upstream Color seem normal in comparison. Yet the alien finds itself in disarray on Earth, from recognizing the rules of society to its own self-discovery, leading to havoc and hazardous results. 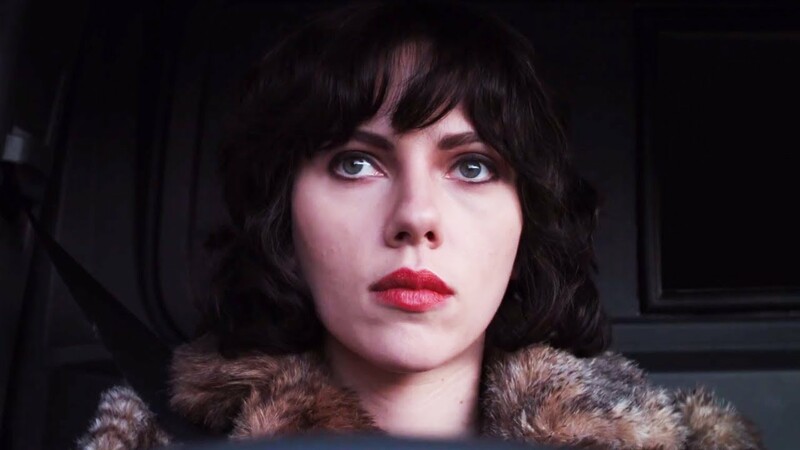 Much of Under the Skin was improvised with live, Borat style action, with Johansson approaching real people on the street asking them questions with an English accent, with Glazer utilizing a series of hidden cameras to not publically reveal the illusion. But these scenes surprisingly don’t stick out from the written segments of the film but rather blend in naturally, allowing Under the Skin to seem completely realistic. Furthermore, the men Johansson entices don’t look and seem like actors but real and everyday people with the hopes and strife we all encounter. For maintaining this provocative mood throughout this picture, both Glazer and Johansson deserve a round of applause. Glazer excels in psychological horror and uses the wide and evocative scenery of Scotland to make Under the Skin look and seem as icy as The Shining. Johansson evokes the blunt coldness and emotionlessness of her character (which in any other context would sound like a nasty criticism but I mean this as a compliment as the highest way) to separate the creature from the humans it encounters. Yet Under the Skin spreads its wings a bit too wide. For much of the middle of the picture, Under the Skin lags and feels repetitive as the alien’s siren routine is stretched out. Perhaps if I were in a mood with more patience I would have appreciated the movie’s slow-pace, but the sluggish timing made me annoyed. The last thirty minutes are redeeming to Under the Skin’s cause, focusing more the beast’s adjustment to the Scotland atmosphere, but with some trimming the picture could be a leaner and better picture. Ultimately, while Under the Skin lacks the qualities that made recent pictures like Take Shelter or Upstream Color complete, it’s a delectable and intelligent horror, a film that’s so rare in this day and age. « What Movie/TV Character Would You Want To Be? Hope you enjoy it. It’s a movie I want to definitely check out again in the future, it really deserves another viewing. Many interesting points, and I enjoyed reading your take on the film. It’s a shame the pace was a problem for you – I have to admit it I liked the repetition of the whole siren thing as it meant the director could gradually reveal more and more of what happens to the men she/it seduces. I think the comparisons with Kubrick are justified; there are certain techniques and ideas that recall him over anyone else. It’s probably not my favourite film of 2014, but it is close. Thanks! I liked that Glazer slowly revealed the full siren routine overtime, but the space in between just felt too lengthy. There’s definitely a Kubrick vibe to Under the Skin, sort of like if someone crossed 2001 over with Eyes Wide Shut and The Shining. I actually really want to watch this again to see if I get a better grip on the picture. This film is a total mind-bender, but it’s a very interesting one. And thankfully, it hardly ever lost its steam either. Good review. Thanks! I felt that the middle of the picture went a bit too slow, but other than that Glazer keeps the film on a steady course. I’m still pondering on that haunting ending. Right up there among the top 2-3 films of the year so far for me. Great read mate. Thanks! I’m not sure right now if it would be in my top 3 of the ear thus far, though I’ll have to watch it again. Thanks. I did like the soundtrack, especially the Psycho-like violins. Ultimately, it ran on a bit too long (in my opinion at least), but I did enjoy Under the Skin.